Made in Sydney, New South Wales, Australia, 1880-1915. The hansom cab is a two-wheeled enclosed horse-drawn vehicle, which was pulled by one horse. It was designed for carrying one or two passengers, on a hire basis, but little or no luggage. On either side of the cab are brass carriage lamps. The large timber-spoked wheels have solid rubber tyres. The driver sat high at the rear of the cab exposed to the weather on a small leather seat padded with horsehair and rags. Access to it from the ground is via steps. Reins from the horse passed through a support on the front of the roof. The driver controlled a metal rod on the roof for opening and closing each of the doors. Passenger access is from either side, in front of the wheels, via a pair of full-length folding doors. Once closed, these provided protection and privacy. Inside the cab is furnished in diamond patterned black leather upholstery on the seats and side panels. On the walls of the cab are leather pockets or satchels with embossed work which probably held the cab fare price lists as two were required to be carried in each cab. The head lining is green woven wool and cotton fabric. The glass windows have roller blinds at the sides. Two small hinged windows are at the back of the cab and beside the right hand one is the driver's whip holder. The lower half of the doors feature an embossed leather pattern inside. 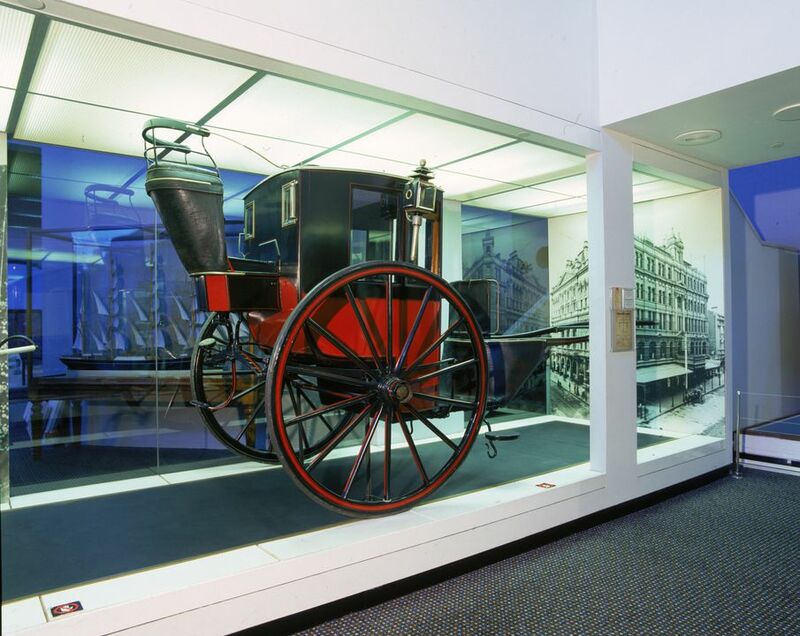 This brougham hansom cab is typical of the type built in Sydney from the 1880s to about 1915. In their heyday in the late nineteenth century, Sydney's hansom cabs made up over half of the city's licensed street vehicles. In 1895 Sydney had 2,180 licensed vehicles, 1,215 of which were hansom cabs. G.V. Portus provides a lively description of the vehicles in Sydney during the 1880s: "Hansom cabs did not impress me so much. They were gloomy looking things of black or dark blue, while the buses [horse buses] were always painted a brilliant yellow. There was not much to see from inside a cab except the horse's tail and hind quarters. But I can remember how exciting it was when the cabs coming back from the races at Randwick used to race each other along Botany Street, especially if the hirers had backed a winner. Also I can remember the cabs on Sunday afternoons, with blinds down and the horse trotting decorously, on the way to Coogee or Maroubra bearing a freight of flirtatious couples. This was the nearest to Tail Light Avenue that Sydney got in those days, and even then there was always the driver for chaperon, sitting above his little world and with his passengers well under his eye through the spy-hole in the roof." Sydney cabs were independently owned by their drivers. Many cabs had two drivers who alternated the day and night shifts. Cabs were regulated by the Metropolitan Transit Commissioners and fares were laid down by them in the 1890s at 1 shilling for 15 minutes at a speed of at least 6 mph (9.5 kph). Apparently the public objected to this "funeral" pace and cabs drove much faster. Licence fees cost one pound a year for the cab and 7/6d for the driver. However, the upfront cost of a "first class" turnout was 100 pounds and many drivers were virtually working for money lenders and financiers. The upkeep of a cab cost between 12 and 14 shillings a week and most cabs needed doing up every 3 months. Even in those times vandalism occurred with repairs to fittings and furnishings required such as replacing window blind tassels which had been cut off and replacing ruined carpets. As well as this the horse still needed to be fed, groomed and stabled. Many cab drivers began as horse bus drivers learning the routes prior to doing their cabbie's exam. Prospective cab drivers also needed a character endorsement form the Metropolitan Transit Commissioners. For the convenience of the public and to give the cab drivers a "fair go" Sydney cabs were allotted ranks and stands. A stand accommodated one to two cabs and was supplied from the nearest rank. The last stand was always visible from the rank and each stand was in sight of the next one. A licensed driver could take his turn on any rank, moving up to the head as the leading cab drove off to vacant stands. There were about 70 stands in the city and immediate suburbs, as well as 30 in outlying suburbs. The most profitable ranks were at the main railway terminus where up to 250 cabs an hour would be hired. Others were in St James Road and Macquarie Street north. In August 1908 the "Australasian Coachbuilder and Wheelwright" noted that in Sydney in 1888 "very few cabs were not of the old fashioned open type, but now the rubber-tyred brougham, light and easy running, with its closed doors and overhead connecting rods is the rule. It represents the highest point of cab evolution, but it looks as though it is the final challenge in its fight for the streets". Sydney's cabs began to gradually decline from the 1890s economic depression. They had competition from trams, the telephone, the bicycle, which was taken up by all classes and, from 1910, the motor taxi. This hansom cab was driven by its 73-year old owner Mr J. Connor of 38 Thomas Street, Redfern, who had begun driving hansoms in 1890. It was purchased by the Museum in 1937 and on 2 December of that year was personally delivered to the Museum's former building in Harris Street, now part of the Sydney Technical College. The last passenger was a member of the Museum's staff, Theodore Roughley (1888-1961), the Economic Zoologist, who rode around the block and down Harris Street in the cab, paying the last fare of 2 shillings. Between the shafts, the cab was smartly pulled by Darkwing, Mr Connor's bay horse, a former trotter. The hansom cab was also escorted by two milk-wagon horses for its final journey and on arrival at the Museum's gates was greeted by a small crowd of boys. Geeves, Philip, "Philip Geeves presents Cazneaux's Sydney 1904-1934", David Ell Press, Sydney, 1980. Geeves, Philip, "The Cab Business" in Newsletter of the Royal Australian Historical Society", may, 1974, p.5-6. Portus, G.V., "Happy Highways", Melbourne University Press, 1953, pp.5-6. "Hansom Cab's Last Stand - In the Museum" in "The Sun", 2 December 1937.